GORGO – the British ‘zilla! What a posh roar you have, my old son! Viewing GORGO as a kid, I considered it a more respectable version of what the Japanese were churning out seemingly just to keep Sunday afternoon programming stupid. I was just happy that everyone’s mouths matched their dialogue! 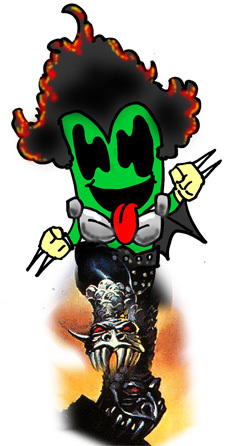 But not to worry – it was just as stupid as Japanese daikaiju. However, as the original GOJIRA (1954) had a compelling warning not to tamper in God’s domain, GORGO has a much more dangerous warning – don’t piss off Mamakins! 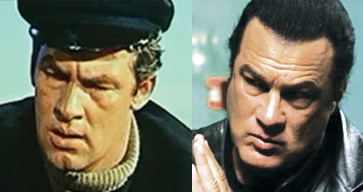 One of these men is Steven Segal, and one is an actor. Starring Bill Travers as Steven Segal and William Sylvester as Hugh Beaumont– (wha–? An attack of the evil twins? ), two British divers off the Irish coast, who discover a large reptilian creature that terrorizes a small fishing village, capture it in the most ludicrous of ways, and transport it to England. A well-spoken little Irish boy named Sean (Vincent Winter) accompanies them with warnings that they should not remove the creature from its deepwater home. Okay kid, go play in some traffic. In London, Segal and Beaumont sell the creature to Dorkin’s Circus. World famous for its dorkins. There’s Dorkin himself, with his Snidely Whiplash pencil mustache and car-salesman suit, looking every bit like the caricature of his name. It was amazing. Not the 65-foot creature – a guy named Dorkin who actually looked like a dorkin! 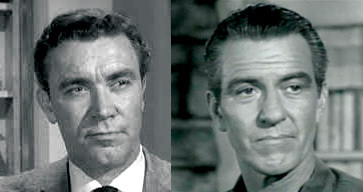 One of these men is Hugh Beaumont and one likes beaver. Dorkin tells reporters that Gorgo’s name is derived from the mythical Gorgon, whose glance could turn a man to stone. And that mythical woman able to turn a man to stone just by looking at him was derived from the act of marriage. Scientists arrive, proving they’re scientists by their extreme British accents, to warn about contamination and to tell Dorkin the Irish are suing for kidnapping Gorgo from Irish waters. Ironic, considering the men who wrote those lines kidnapped Gorgo from Japanese cinema. Cute, how they’re trying to pile on a story before the Running and Screaming starts. A reporter takes a flash-picture of Gorgo, and Segal slaps him away, shouting, “That’s a hell of a dumb thing to do!” Really? Sez the guy who cuts the creature loose from its nets without securing it first, so that it jumps up and goes to town. I’m still waiting for someone to say to Segal, “That’s a hell of a dumb thing to do!” Or maybe they’re scared he’ll aikido them. Dorkin displays Gorgo in a giant pit, where he amuses the crowds by sidestepping like Travolta and roaring like a godzilla, or a Gorgon-zola, whichever sounds cheesier. Little Israeli boy Chaim Witz visited Gorgo and immediately started fashioning his footwear for Destroyer. Attack of the evil twins? You bet! Here comes Gorgo-zilla! 365 feet high. In a rubber suit. 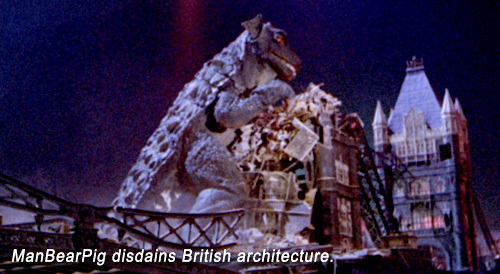 Y’know, the Japanese used men in suits for their monsters due to budget and other problems, but you’d think the British would know better – or at least have more shame! The moviemakers were certainly ambitious – they had to build two sets of miniatures – one set for the bebeh, one much smaller set for the mother (same suit different day) to look monstrously bigger. Meanwhile the stars of the movie run around doing nothing in particular, inconsequential to the creature’s quest. While the little boy smiles. Funniest scene is William Sylvester falling-down drunk trying to free Gorgo in remorse. Did he really have to get plastered to do this? What would June Cleaver say?? No matter, as he is sober immediately five minutes later when mama arrives. Lady G returns majestically to the sea with her teeny tahny bubba by her side; brings a salty tear. It’s one of the best endings in any giant creature movie. It actually had a salient point! Apparently this was not the originally intended fates of the Gorgos, but the producer’s kid cried too much when both creatures were killed, so they tacked on this happy ending – but this is the only possible ending that makes sense! Can you imagine how soulless, cynical and monstrous the humans’ reputations would have been had they gunned down a mother in search of her child?! Bill Travers and William Sylvester would never have worked again. To say nothing of Steven Segal and Hugh Beaumont! Writers: Robert L. Richards, Daniel James. Starring: Bill Travers, William Sylvester, Vincent Winter, Christopher Rhodes, Joseph O’Conor, Bruce Seton, Martin Benson.